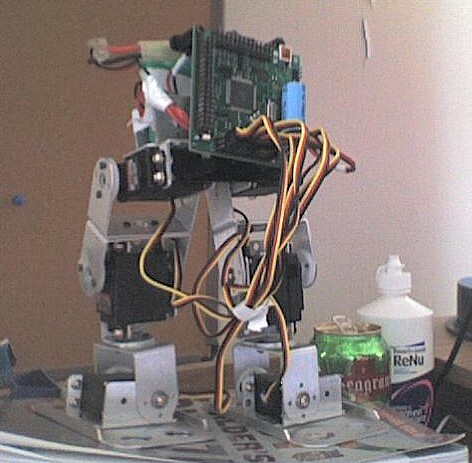 The SoR Biped Engine is simple to use software to get your robot biped walking within ~30 minutes by PC control. All biped motion patterns are called 'gaits'. A gait is a stored list of motions that the biped can perform. A timer of sorts is used to control each motion. The SoR Biped Engine sets up these gaits in software for you, and gives you the ability to control the speed at which these gaits are performed. You simply start with the default Axon software, install the Biped Engine files, then you tweak the gait to do what you want. Almost zero coding is required. Read *ALL* instructions start to finish before following them. 1) First, install your Axon software if you haven't already. 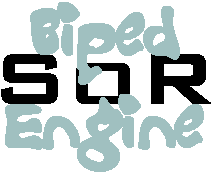 2) Download the SoR Biped Engine v2.1 files into your Axon software folder. It will ask to overwrite both the default control.c and hardware.c files. Say yes, but make sure you backed up your older files first. You'll also see a gaits_ERP.c file, useful for commanding robot arms instead of legs. That means you attach the servo for the left foot into H6. 4) gaits.c defines gaits. Open up this file. First, you need to set home position, so modify where you see 'initialize home variables' and 550 to tweak the servos into the right positions. Then right after you will see 'define walking forward gait' with a huge matrix after it. That matrix you will have to tweak until your biped is walking. You do not need to modify any other part of this file. 5) control.c is your 'main'. Currently its set up that if you use HyperTerminal with USB, pushing the letter 'h' brings the robot to home position, and letter 'w' for walking forward. My Axon tutorial explains how to use HyperTerminal. 'o' and 'p' toggle the green LED, useful to verify a working connection. You do not need to modify this file. The number represents speed of the gait, as higher numbers mean slower motions. You probably want to set it really slow while you develop and tweak your gait, say 100. 8) Future versions of this software will help you incorporate sensors for balance. Please check back for updates!